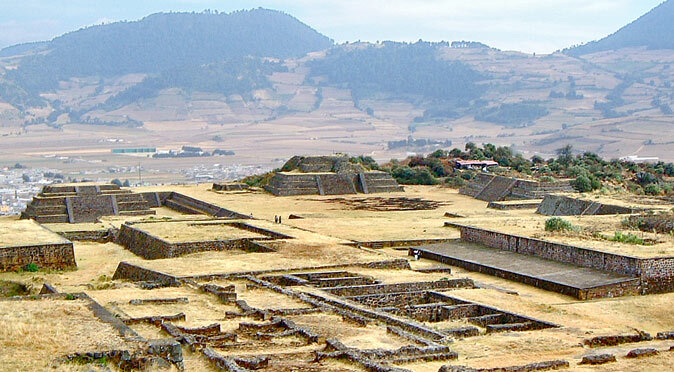 W0013TO: The Pyramids of Group A and Group B The most prominent area of Teotenango is the eastern flank which overlooks the Valley to the mountain in the background. This area is comprised of two plazas, Group A (to the left in fig. W0013TO) and Group B (to the right in fig. W0013TO). 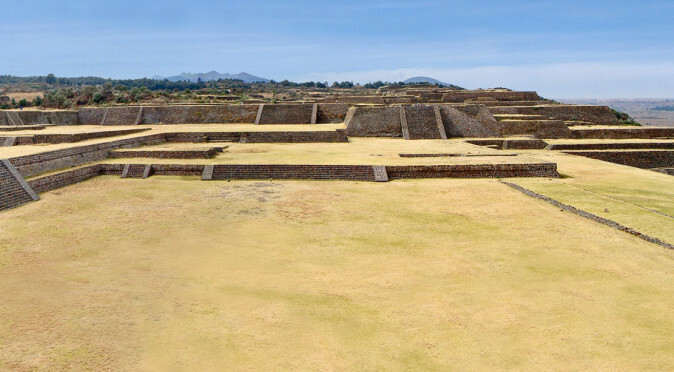 It is no accident that the largest temple bases at Teotenango stand on the eastern edge of the complex and look straight out to the mountain ranges behind which the sun arose each morning and the stars rose each night. The craggy mountainous horizon produced natural points to mark celestial observations, and from Structure 1A four peaks in the distant mountain range produced natural markers for ritual calendar events. 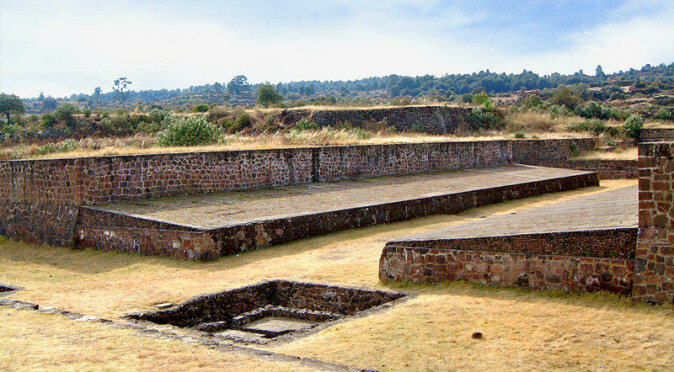 The structures here also reveal a lot about Teotenango’s history and influences. 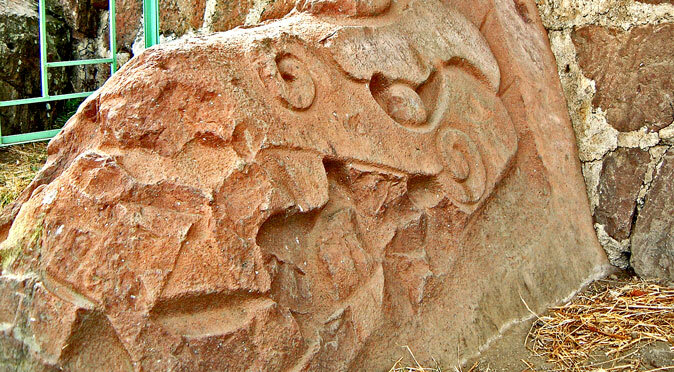 Group A has clear influences from Teotihuacan with a “Talud-Tablero” style stepped pyramid and boundary wall. The “Talud-Tablero” style uses four elements in its construction: a sloped wall, a protruding cornice, a vertical wall, and a horizontal surface. Each tier of the pyramid repeats these four elements to produce a very distinctive style that is attributed to Teotihuacan. The style is also evident in the walls that rise out of Plaza A t to the south and west. Group A is the lowest level of the site and is also where the entrance to the site is located, so it makes sense that this is the earliest construction level. 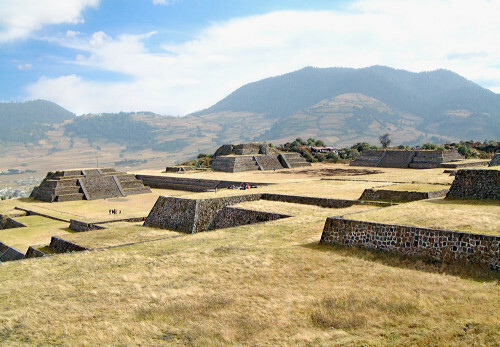 Therefore, it appears that the initial construction of Teotenango’s main ceremonial centre was influenced by Teotihuacan. Structure 1B (the tall structure in the centre of fig. W0013TO) is similarly constructed to the 1A, but with only three elements: a sloped wall, vertical wall and a horizontal surface. 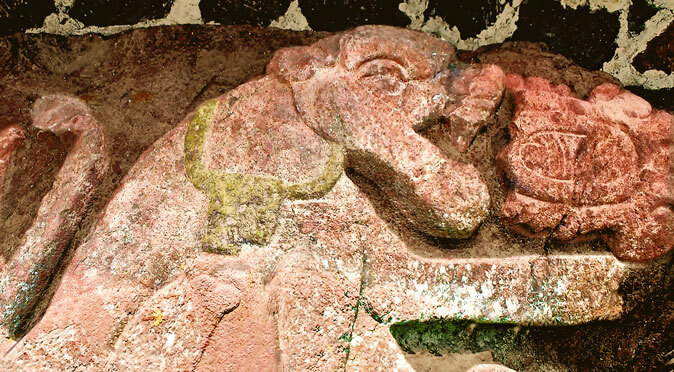 This style is more typical of Xochicalco, a huge trading city located 30 miles south-west of Teotenango, which was founded shortly before work on the Cerro Tetepetl at Teotenango was started and at around the same time the town was built on the valley floor. Curiously, Structure 3B (the long flat structure to the left of 1B in fig. W0013TO) is built with the Talud-Tablero styling of Structure 1A, which suggests it was built at the same time as 1A and was the first structure in Group B. It is also thought that Structure 3B was the base of a palatial structure rather than a temple. Structures 1A and 1B would both have been topped with temples constructed from degradable materials, such as timber and mud brick.